At Audion, our aim is to deliver music as close to the originally recorded sounds as can possibly be achieved through valve/tube amplifiers such as the Audion, Sterling, The Silver Night and Golden Night through to our high end amps like the Golden Dream and our award winning Audion Premier Quattro all silver wired pre-amp. We are able to do this through extensive research of various circuit topologies, together with specially selected components from around the world and hand built in to our amplifiers. This puts us at the forefront of valve audio reproduction, delivering world class products that we know you will enjoy. Your Audion is a sound investment! 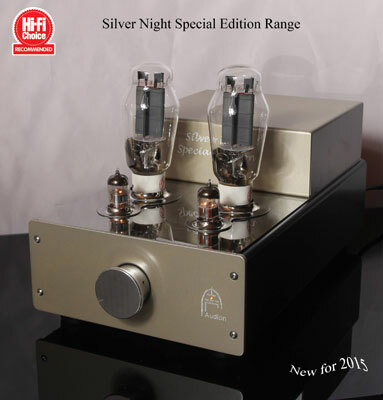 New for 2017, the all new Silver Night Special Edition silver hard air wired 300B power amplifier. Featuring a new look, chassis design and a new, more detailed quality of sound. Now also has a matching pre amplifier, integrated versions and mono blocks. Read more here. Our special edition has now been reviewed and received the Recommended component award in Hifi Choice October 2015, you can read the review here. New for 2018, Our Select range of passive pre amplifiers has now expanded to include 3 new versions. A Transformer Volume Control, a 48 way stepped attenuator, and a MC step up transformer version. Multiple options are available.